The Seven Days Campaign, fought from June 26th to July 2nd, 1862, represented the Union’s finest chance to put an early end to the great rebellion, and the Confederacy’s best shot at “bagging” an entire Union Army. Virtually unknown when appointed to command the month before, Gen. Robert E. Lee promptly renamed his force, "The Army of Northern Virginia" - defining a future theater of operations the present defenders of the swampy ground east of Richmond could scarcely imagine. Both aggressive and imaginative by nature, Lee summoned virtually every spare unit the South could muster for that rarest of Southern advantages, numerical superiority. His planned counterattack, a massive turning operation designed to roll back the divided Yankee forces and seize their main supply base, would ultimately fail to come about due to Confederate inexperience in operations and command failures. 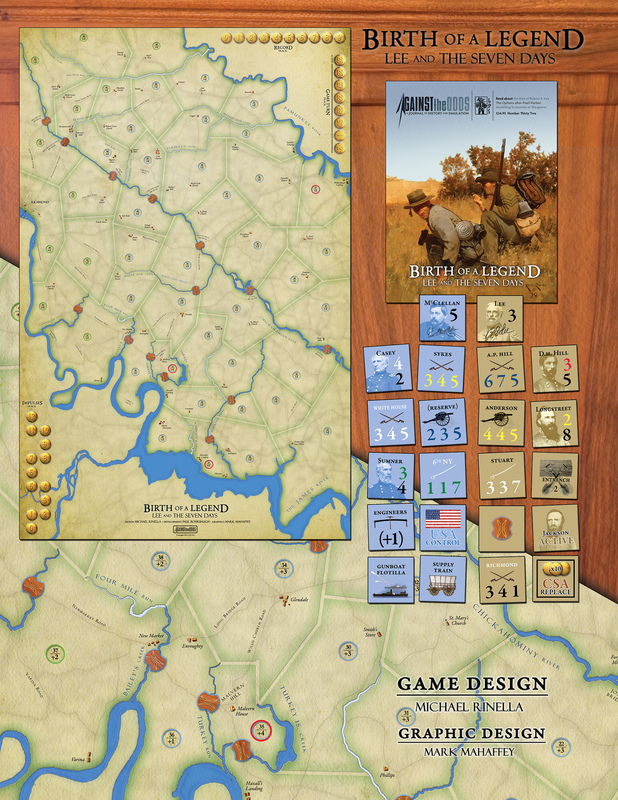 Birth of a Legend by Michael Rinella, is his second 19th Century area-map game, applying his award-winning Not War But Murder impulse game system to the American Civil War. The game includes one 22” by 34” inch area map, 176 large counters, and 16 pages of rules and charts that include extensive examples of play, designer notes, and variant rules, all to ensure many enjoyable game sessions on this campaign that played a decisive role in American and military history. Bonus Item Included! All copies of this issue contain a small expansion kit (rules and counters) for our earlier There Must Be a Victory game featured in ATO #26. If you enjoy unusual naval developments, be sure to get a hold of this issue! Requires Adobe Acrobat Reader version 6 or later. Free download here. Download the Birth of a Legend rulebook (in PDF format).